The hype behind this latest installment in the King of Fighters series was definitely impressive. After Cashcom decided to release a very barebones rendition of Street Fighters, this was KoF’s chance to quickly show the fighting game community how it’s done. It does not dissappoint as there is a lot of content here to keep you satisfied without having to wait months for extra features. While SF V still wins with its final package and simply having the more interesting characters/smoother gameplay, King of Fighters holds its own and the series has come a very long way since the old PS2 title that I played. The story mode is like the classic fighting game titles. Each team has an ending, but there is a story sprinkled in as well. Every character shares the same opening and then the big event where a cosmic being by the name of Verse shows up. You learn a little bit about Verse from some of the character endings, but either way, he means business! Taking him down is definitely going to be difficult, but the King of Fighter heroes are up to the task! Some of the story endings are lacking a little. Since every team has an ending, it makes sense that not all of them would be hits. I mostly enjoyed the ones that delved into why Verse shows up and the ones that foreshadow events in King of Fighters XV. The ones that are more about day to day life like having a buffet at a bar or talking about animal names are a little less interesting. It’s partially due to the fact that I don’t know the cast too well yet though. I’m sure that they’ll get cooler as I pick up more of the games and get used to them. The story segments that the characters share is always pretty epic though. I do hope that these endings go somewhere though. There are a lot of hintings at plot twists and such which involve Verse, but if this never pops up in KoF XV, then it’ll be a bit of a waste. King of Fighters did a great job with the soundtrack. The theme when Verse shows up is really good and I also like the main theme of the game. I can’t really tell what the singer is saying to be honest, but the beat is good and the liveliness of it all fits the game rather well. The stages also have good themes which is a must for a fighting game since you will be hearing them quite often. Likewise, the graphics are also very sharp. The cinematics that are present look very good and the character models are all on point. It’s all very clear and the actual gameplay will keep reminding you that this game is current gen. The interface and menus are also very good and I would have liked something like that for Super Smash. I’m still not crazy about the way that the menus work in that title. KoF XIV is similar to the PS3 in that sense as everything feels very new and modern. Now, let’s talk about the actual gameplay. It’s a classic 2D fighter where you have standard attacks and power moves. You’ll want to throw, roll, and block as well. There is a lot of depth to be found in this title. If you aspire to be a world class player, you should expect to spend a lot of time in the training room. I’d say that the game has even more options than the various Street Fighter games. There are a lot of different ways to attack and dozens of variations so it will likely be overwhelming as you try to memorize the moveset from all of the characters. It’s easy to pick up as a beginner and hard to master, which is a good balance. I definitely like the gameplay, although I would put it under Street Fighter and Tekken. I think what holds it back a little is just that the character models are a little slower. Tekken makes up for this with how much damage you deal per hit. The fights in King of Fighters will always take a little longer. The 3 on 3 default mode is always a lot of fun though and if you’re going to have a long fight, then it may as well be in style. I haven’t gotten a chance to test my skill against any actual players yet, but I’m sure that a free PS+ weekend will be occurring soon so then I’ll be sure to go online. I’m confident that my button mashing skills and experience with fighting games should serve me fairly well. After you’ve played story mode, you can also head to the Trials and Tutorials. Survival Mode is also at the ready. The tutorial mode goes very in depth and teaches you all of the concepts in the game. It can be difficult towards the end, but you’ll be glad that you played it. For a game this complex, you will need to actually think about what you are going to do. Button Mashing is heavily discouraged based on how it is set up, although you can make do if you know how. The trophies seem tricky, but a little more achievable than some other fighting games like SF IV or SF V. I got a decent amount of them, although it’s a fairly low amount if you look at the game on the surface. A lot of the trophies are online based so I can’t really go for those quite yet. It helps add to the replay value that is found here. As this is a fighting game, that means that the replay value is automatically infinite. Whether you play locally or with friends online (If you have PS+) the gameplay should never get old. This is the kind of game that you can have fun playing for hours and hours on end as you try to improve your skills and rank. Grabbing all of the illustrations, movies, and sounds should also take some time. Verse made for a good original villain here. I hope to see him return although I definitely want God Rugal as well. That guy was awesome in the old games. Terry was about as cool as I’d expect him to be and Kyo seems like a good main character as well. I’m still not sold on Iori, but maybe he’ll get cooler as he goes along. It’s pretty neat how there is a Freddy Krueger parody here as well and even a guy who looks rather similar to Ryu. The ice character is also cool since having someone with super powers is always pretty neat. As it stands, I do think that the cast is more interesting than Virtua Fighter. If we get more stories as the games go on, maybe it’ll continue to pass other video game series as far as the cast is concerned. Overall, This game is certainly worth the full price. It has a very large cast so many of your favorites should be here and finding a character who fits your play style should come naturally. The graphics and soundtrack are solid as well. The only weakness in the game would be the story to an extent, but I still did like the animated cutscenes and ultimately, you’re playing the game for the gameplay more than anything else. If the new Super Smash could be a big success without a story, there’s no reason why King of Fighters can’t do the same. I definitely recommend checking this game out and then we’ll see if you ultimately agree that Terry Bogard is the most intense character in the game. 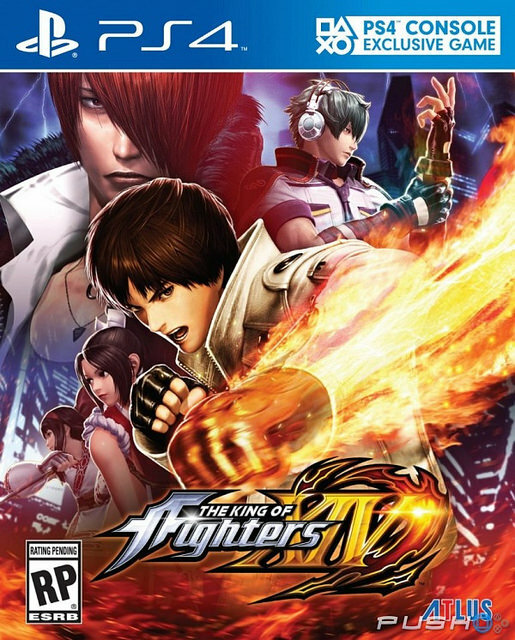 This entry was posted in 8 Star Games, Game Reviews, Games, Reviews and tagged Game, Game Review, King of Fighters, King of Fighters XIV, PS4, PS4 Game, Review, Sony, Video Game Review by dreager1. Bookmark the permalink. Hey man, long time no see again. I enjoyed you review for this game, very in-depth and feel as if I have played it for myself personally, covered every aspect personally (especially those endings…., wasn’t feeling a couple of them. Excellent Job! Nice to see you and thanks! Glad you enjoyed the review.